The Independent wrote of The Patagonian Hare that it ‘reads to English eyes like the caricature of the Left Bank intellectual.’ Was your impression, when reading the book in the original language, anything of this sort? Were you at all concerned you would accidentally represent Lanzmann in this way, having maybe a more Western concept of the text? I don’t think there was any danger of it being an accident, even in French Lanzmann comes across as something a ‘caricature of the Left Bank intellectual’, but his voice is powerful and compelling. It is hardly surprising given that – as the lover of de Beauvoir, the friend of Sartre, the editor of Les temps modernes Lanzmann was one of those who all but created the prototype of the ‘Left Bank intellectual’. Throughout his life he has militated, campaigned, written and protested, always with great vehemence and passion. One may not always agree with everything he says, but if his memoir has at times a certain swaggering pride, he has a lot to be proud of. Shoah is one of the defining films of the last century and Lanzmann’s dogged, unrelenting single-mindedness, his candour and his passion are a crucial part of what makes his films great. 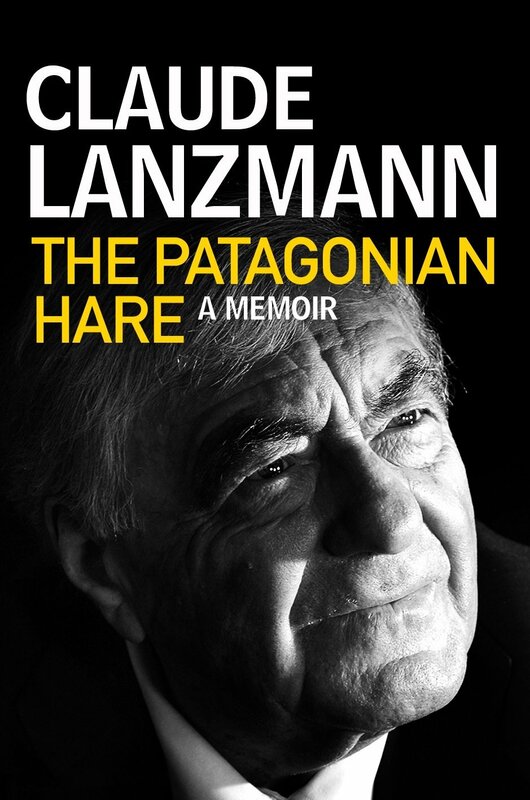 It’s true that I strove to preserve certain constructions common in French (long sentence structures, a dense allusiveness, frequent digressions) that in English can seem affected, but they seemed to me – and were to the author – crucial to Lanzmann’s inimitable sinuous and discursive style. My role – inasmuch as I am able – is to echo the author’s voice as faithfully as possible, as closely as (my) English will allow. It is – as with everything in translation – a subjective decision; I can only recreate the voice that I hear. One of the boons of working with an perceptive editor is that s/he can often help with any blind spots. The Patagonian Hare has been translated into Spanish, German, Italian, Hebrew, Polish, Dutch, and Portuguese, as a translator of multiple languages, do you think your translation would be different if translating from one of the different translated versions of the book rather than the original? I can’t possible imagine translating the book from a language other than the one in which it was written. My guess is that in Spanish, Italian and Portuguese, being romance languages which are similarly structured, the book would read very much as it does in French. Certainly Spanish like French commonly allows for a discursive style, long sentences, scholarly digressions, lofty style. Dutch and German, (like English to some extent) by their very nature would have to recreate the text somewhat differently. Would Lanzmann’s voice come through as the same in all of these? Much of it, I hope, would. Like me, the various translators would attempt to channel the voice in the original text. Even so, to translate from any of these translation one would invariably lose much: since each translator must choose words, some ambiguities in the original will lost (and new ambiguities will be introduced) so working from this text would present different choices and different challenges. If, however, the question is whether there is some intrinsic ‘Frenchness’ to a text that differs from Spanish or Dutch, then yes and no – there are sounds and cadences, connotations and associations which are embedded in language. It is one of the many reasons why no two translations can ever be exactly alike – something I’ve had the pleasure of discovering the a number of translation slams organised by the wondrous Daniel Hahn. Do you think if you picked up the book, say in Spanish, that you would have a different vision of this Frenchman and his lifestyle? Would these differences be to do with the translator or the language? I’m not sure – I doubt it. Lanzmann’s voice is powerful and unmistakable, his opinions on anything and everything are candid, forthright, and brook no argument. Any translation which failed to bring that across would have lost something essential about the man and his life. There would be differences, certainly, and cumulatively the decisions made by a translator might sway one’s feeling about the narrative voice positively or negatively. In this particular case, I know that the author was painstakingly involved in the translations into German, Spanish, Italian (and English) and so will have stamped his inimitable personality on each.